The Let’s Move! campaign against childhood obesity just celebrated its first anniversary. The goal of this campaign is to reverse the childhood obesity epidemic within one generation. Although the goal is an ambitious one, I believe it is achievable, and I believe it must be achieved. Each parent must take responsibility for the health of his or her own child. But society plays an important role, too, especially in the lives of the children who rely on schools for much of their daily nutrition. School lunches must be made healthier. The Let’s Move! campaign has invited chefs around the country to work with their local schools to come up with delicious, healthful ways to feed their children, and ways to get children excited about eating better. The Chefs Move to Schools initiative provides sign-up forms for interested schools and interested chefs. Within a week after signing up, chefs receive an email with information on how to connect with aschool in their area. In this graphic, pulled from the Chefs Move to Schools page [link: (same as above)], the pencil icon indicates the schools that have signed up, asking for a chef’s help. The fork/knife icon indicates a chef who has signed up for the initiative. As you can see, Central Texas chefs are eager to do their part to help area children eat healthier. Participating chefs work with their local school to develop a plan to improve kids’eating habits. Chefs might invite local farmers to talk to children about local produce. They might provide healthy snacks at school functions, to replace the customary high-sugar, high-fat fare. They might teach hands-on cooking classes with an emphasis on whole grains and fresh fruits and vegetables. They might help the kids plant and tend a school garden. Each school and chef can work together to develop a plan that works for them. The important thing is that children learn that eating healthy doesn’t have to be a punishment. Healthy food can taste delicious. 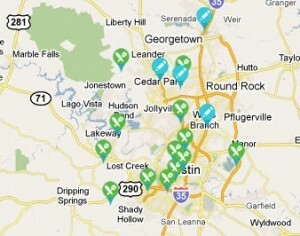 According to the map above, the Austin chef community knows about the Chefs Move to Schools initiative, but only a handful of schools are seeking the help of a local chef. Ask your school principal if they’re aware of the program. Or better yet, forward this article to him or her. One out of three American children is overweight or obese. Together, we can change that statistic. Chefs Move to School could be an important step in improving our children’s health.